Layla was being teased at school in Virginia for wearing an R2-D2 jacket and Guardians of the Galaxy shirt. After hearing about this, the local chapter of the 501st Legion, Garrison Tyranus, decided to step in and help out by issuing her a set of Stormtrooper armor. This has happened a couple of times over the years: back in 2010, a girl named Katie Goldman faced much the same thing. Members of the 501st Legion around the world decided to step in and help, sourcing a scaled-down stormtrooper costume, and presented it to her. Taking it one step further, Layla became the next recipient of the custom Stormtrooper armor originally built for another girl (Katie Goldman) who was in a similar situation. 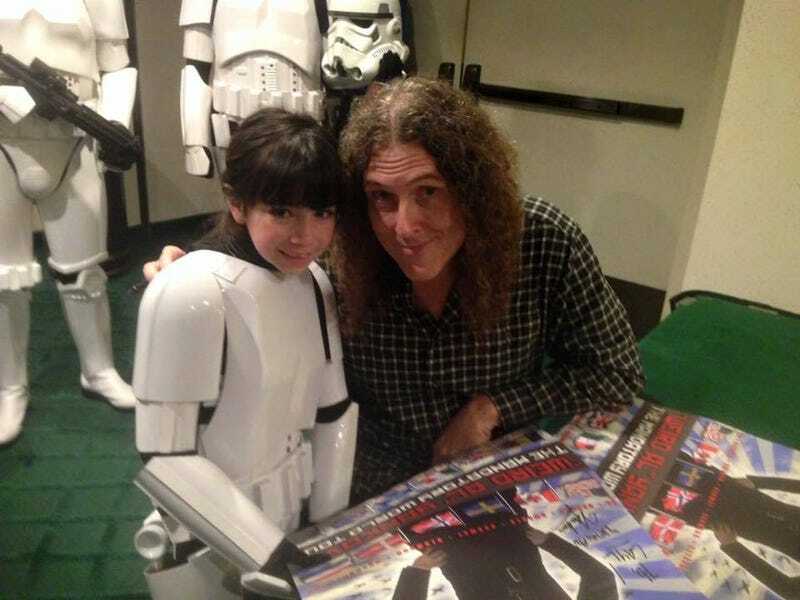 After suiting up, Layla was whisked away to meet “Weird Al” Yankovic at a local concert where 501st members were participating on stage. Layla, Allison and Katie’s treatment is nothing short of horrific. As Annalee noted back in 2010, this wasn’t nerd-hating, this was a girl being targeted because people believe that stories like Star Wars aren’t things girls should like. That this is still happening isn’t the takeaway that should be pulled from this, however. The takeaway here is that despite instances of bullying, there’s a larger community of people who are willing to lend a hand of support, whether that’s an international costuming group or just some other fans willing to point out that Star Wars isn’t just for boys. More importantly, seeing this suit of armor passed from girl to girl is just awesome, and each one learns that they’re not alone in what they enjoy. Disclaimer: I’m a member of the 501st, but I wasn’t directly involved in this event.